View looking south down into the city of Nazareth. Left of the center of the image note the distinctive black–roofed building. 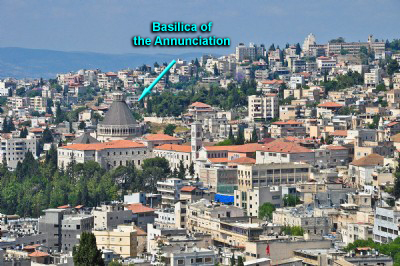 This is the Basilica of the Annunciation that was built over the site where tradition maintains that the angel Gabriel announced to Mary that she would bear the Messiah (Luke 1:26–38). When this church was built—in the 1950’s and 1960’s—excavations revealed some archaeological remains from the first century A.D. Note how this “center” of Nazareth is situated down “in the bottom of a bowl”—the hills rising up all around it. In Jesus’ day it was a rather small insignificant place. For a brief description of Nazareth Click Here. To view additional images of Nazareth Click Here. Image from the Zondervan Atlas of the Bible, p. 205. To view/use additional images from the Atlas Click Here.